Click & Collect orders placed on Friday 17th November will receive the 20% discount as long as you collect by the order expiry date shown on your order confirmation email. When you arrive in store, if you have reserved your items using Click & Collect then follow the signage in store to collect your order. If you are collecting on Friday 17th November, then you can also pick up any additional items in the store to qualify for the 20% discount. If you are collecting after Friday 17th November then the 20% discount will only apply to the items on your Click & Collect order. When you arrive at the till, present your 20% off coupon to the cashier to qualify for your discount. You can either print the coupon off or present on your mobile phone. Offer is valid for in-store use only. Not to be used in conjunction with any other multi-buy offer, % offer or other coupon. Offer excludes all Video Games (consoles, software and pre-orders), Baby Milk/ Food/ Formula, Gift Cards/Vouchers, Bugaboo, Insurance, Pre-orders, Reusable Bags and Carrier Bags. Only one coupon can be used per transaction. Cannot be exchanged for cash. Cannot be redeemed against online/direct orders placed in-store. Offer cannot be used in conjunction with a staff discount card. Click & Collect orders placed on Friday 17th November must be paid for in-store by close of store on Sunday 19th November 2017. Any additional items selected in-store on Friday 17th November qualify for the 20% discount. Any additional items selected after Friday 17th November would not be eligible for the 20% discount. 20% offer is not available for use on any Take Time to Pay/Layaway agreements initiated on Friday 17th November. 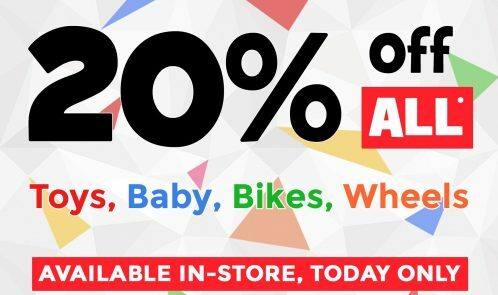 Coupon is valid in-store at Toys ‘R’ Us UK Stores only, and cannot be used online for home delivery. Valid Friday 17th November 2017 only. Store Manager Treat As B279.